July 2018 The Metal Museum, Memphis TN acquired the sculptural piece "Ornament Study" for their permanent collection. 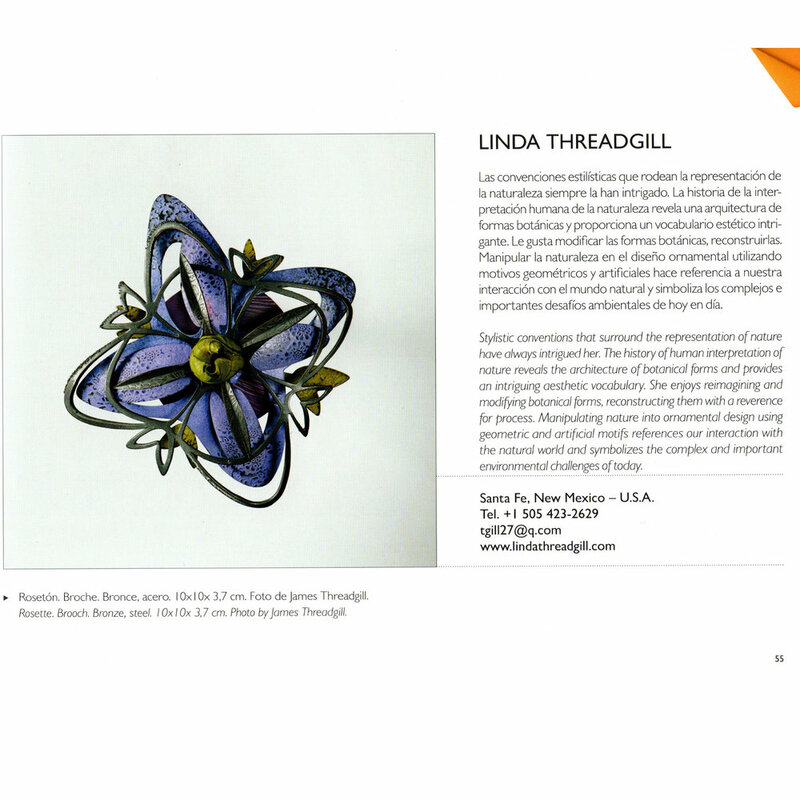 The piece, which was first featured on the cover of Metalsmith Magazine in 2009, and which was featured in the exhibition, "Linda Threadgill, Master Metalsmith 2015, will also travel with the 2018-2019 Metal Museum exhibition "Crafting a Legacy". 2018 ARTISTAR JEWELS Gala Jewelry Exhibition, Milan, Italy. Represented by two Rosette Series brooches. 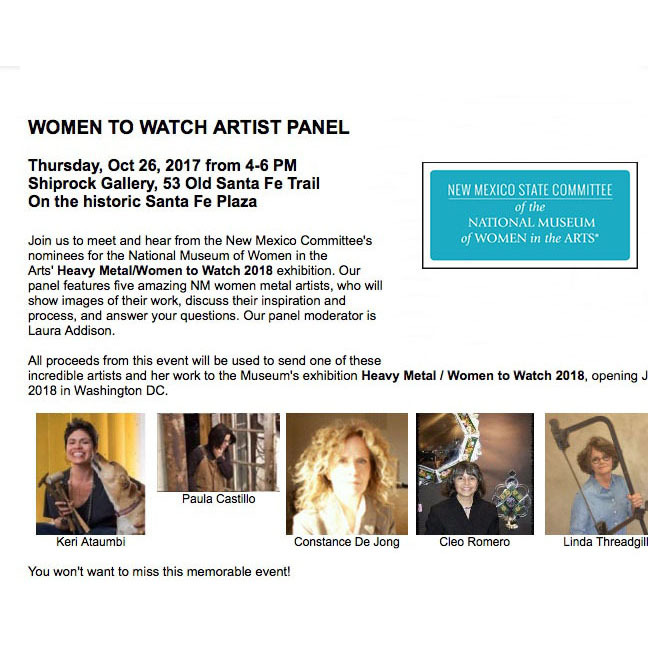 Nominated to represent New Mexico in the Women to Watch: 2018 exhibition at the National Museum of Women in the Arts, Washington, DC. In February, 2018, the Museum of Fine Arts, Boston acquired the "Garden of Lights" Menorah for their permanent collection. The sterling silver, bronze and walnut menorah was created in 1999 and measures 16.25 x 16.25 x 4 inches. It was first displayed in New York at the Steinbaum Krauss Gallery in the exhibition: Magic and Ritual: Hanukkiahs Seen Through Contemporary Eyes, and later at the Nathan Rosen Museum Gallery in Boca Raton, FL as well as the 2015 Master Metalsmith exhibition Linda Threadgill, Cultivating Ornament in Memphis, TN. JOYERIA CONTEMPORANEA 2017: Contemporary Jewelry Yearbook, 140 pages full color, as well as International Exhibitions: JOYA Barcelona, MADRID JOYA, ESPAIJOYA Barcelona and INHORGENTA, Munich, Germany. COMA 2017, Colorado Metalsmiths Association Annual Convention, Salida, Colorado. Guest presenter. An Exuberance of Color in Studio Jewelry, Tansey Contemporary Gallery, Santa Fe, NM, 2016. Go For Baroque, Racine Art Museum, Racine Wisconsin, 2016. Shadow Themes: finding the present in the past. 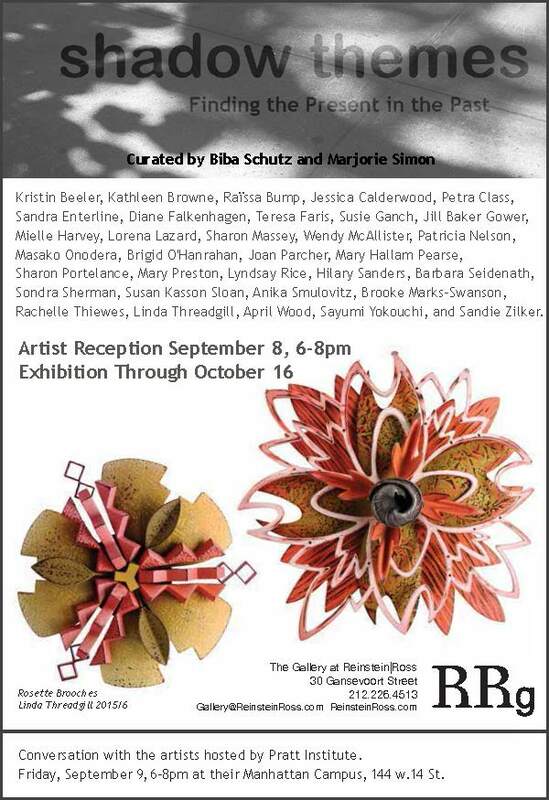 Invitational exhibition at the Galleries at Reinstein/Ross, New York, NY. 2016. Linda Threadgill: Cultivating Ornament, Master Metalsmith 2015, Metal Museum, Memphis , Tennessee. Exhibition of jewelry, hollowware and sculpture, September-December 2015. 68 page full-color catalogue available through LINKS page. Penland School of Crafts, Summer Workshop Instructor, Penland North Carolina, 2014. Surface Patterning Techniques.